Kate Lowe studies transportation at the intersection of policy, funding, and social equity. 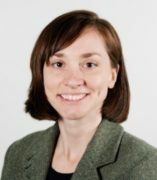 Her work examines how varied stakeholders and transportation policies interact across different levels of government and how this impacts transportation investments. Much of her work has focused on how federal funding programs interface with local funding, with an emphasis on equity implications. She also studies the transportation perspectives and experiences of low-income populations and has completed work on low-income households in Louisiana. Most recently, she is turning to racial dynamics and local investment choices around streetcars. She received a Ph.D. in City and Regional Planning from Cornell University, a M.A. in Community Development and Planning from Clark University, and a B.A. in Cultural Anthropology from Bard College. Lowe, K., Reckhow, S., & Gainsborough, J. (2016). Capacity and equity: Federal funding competition between and within regions. The Journal of Urban Affairs, 38(1), 25-41. DOI: 10.1111/juaf.12203. Lowe, K. (2014). Rethinking competition in TIGER: Lessons for federal funding and public administration. Public Works Management & Policy, 19(4), 345-350. DOI: 10.1177/1087724X14550758. Lowe, K. (2014). Bypassing equity? Transit investment and regional transportation planning. The Journal of Planning Education and Research, 34(1), 30-44. DOI: 10.1177/0739456X13519474.